Welcome back to Donist World. I’m Donist, and I am joined by our CFO Obie (my friends’ Boston terrier) and by our marketing director / administrative assistant / party planner / Daredevil enthusiast Tulip (my dog, Obie’s sister). Okay, breathe, Donist...just breathe. <phew> Okay, my entire blog post vanished for a second there, but I was luckily able to retrieve it. Criminy, that was close. Anyhow, Tulip and Obie are not speaking to each other right now, as they both have finished watching Daredevil and they have both dressed up as ol’ Hornhead today. The problem is that they do not believe there can be two Daredevils walking around the corporate office (Mom’s basement) at the same time. <sigh> I actually had to write into the “Employee Conduct” policy a clause stating that anyone can dress up as Daredevil if they so choose. But between us...Obie dressed up in an old red towel that was hastily sewn into a costume, and Tulip has a fully-functional leather outfit complete with billy clubs that even a Boston terrier can use. No contest as to which is better...just wait until get a load of my costume when it arrives. Woo ha! Anyhow, I’m glad I retrieved the post. So, grab some tacos and a strong ginger ale and enjoy this week’s post...then cue up some Daredevil on Netflix. Thank you for reading. 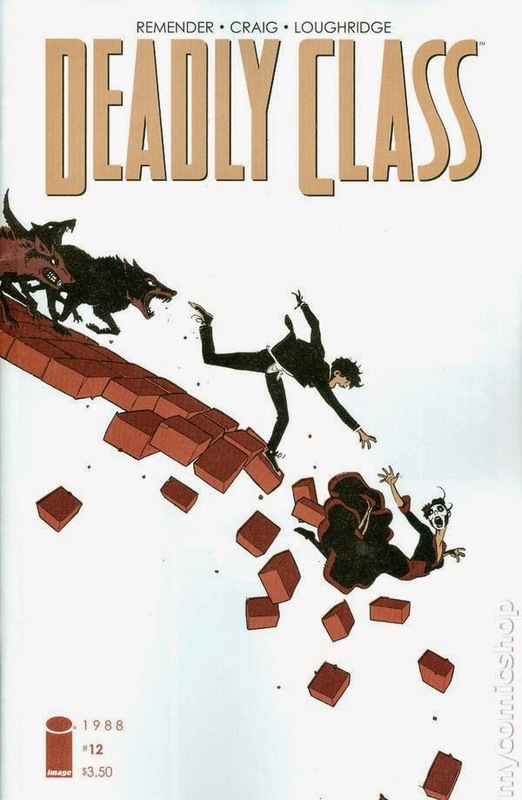 Deadly Class #12 - Written by Rick Remender, illustrated by Wes Craig, colored by Lee Loughridge, lettered by Rus Wooton, edited by Sebastian Girner, published by Image Comics. 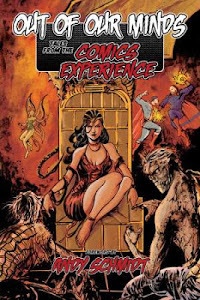 After the death and destruction of last issue, Marcus and Maria find themselves facing down a threat even greater than that of @#$%face and his entourage of inbred psychopaths: El Alma de Diablo, head of the most violent cartel in all of Mexico. The fact that Marcus is carrying around the severed head of El Alma de Diablo’s son, does not bode well for the teens. It’s only been a month or two since the conclusion of Deadly Class’s second arc, but it was a painful wait to finally pick up after that insane cliffhanger ending. The creators don’t miss a beat. The cover I bought for this issue pretty much sums up the mood of this issue: one of a desperate struggle to stay alive against impossible odds. My main takeaway after reading this issue — besides the need to see what happens next — is that Maria is a badass. Not only is her character design one of the best in the book, with her face painted a la Dia de los Muertos and gorgeous flowing black and red dress, but those deadly fans she uses are just plain cool. You have to see her in action to see what I mean, and action is what you most definitely get with this issue. Craig’s storytelling skills continue to amaze as he mixes both low-panel-count and high-panel-count pages throughout to keep your eyes whipping through the scenes, unable to break away for fear of missing what happens next. Even if this issue were in black and white, it would be stunning, but Loughridge’s predominantly monochromatic panels and knockouts pack such energy and excitement into Craig’s imagery that you can’t possibly turn your gaze away. The page with Maria squaring off against Chico’s brother is one of the best to date...criminy, denizens! <sigh> I’m not sure why I do this to myself. Last issue, and now this one? Each leave you scrambling to see what happens next, and of course you have no choice but to wait. But that’s what we love so much about comics. Amiright? That driving need to make sure the characters we’ve become so attached to make it through okay, and to be left playing possible outcomes in our heads for days afterwards. If you have not been reading this fantastic Image offering about a school for assassins set in the ’80s, then you can quickly catch up with the first two trades along with this issue. Next month’s release can’t come soon enough. VERY HIGHLY RECOMMENDED! Chew #48 - Written and lettered by John Layman, illustrated and colored by Rob Guillory, color assists by Taylor Wells, published by Image Comics. Applebee and Caesar are finally getting released from the hospital, but not without some...enhancements. Meanwhile, Tony and D-Bear are investigating what happened to Mason, Olive (Tony’s daughter), and Amelia (Tony’s lady love), but what actually happened in the broken and bloodied hospital room might not be what he expected. New food-based powers? Check. A story that continues to intrigue and excite? Check. Art and colors that only get better with each passing issue? Check. Blatant and subtle laughs? Check. Another darn-fine issue of Chew? Check, check, and what the heck, check! Honestly, at this stage in the game, y’all know what this comic is, and how phenomenally awesome it is. Seriously, I might as well just list the title, creators, and publisher with only “Yup. More of the same” following. That is not a knock on the most unique comic on the stand, where the worst-case-scenario issue is merely very good, and the opposite end skating the heights of all things heavenly. If you have been reading and enjoying Chew, then you are well aware that the new issue you are about to read is going to have you LOLing...and occasionally crying. C’mon, this issue has a group called the “Jellyassassins” for cripe’s sake — where do these creators come up with this stuff? Buy it if you haven’t already. You know you need to. If you haven’t read the hilarious — and sometimes gross — Chew, then you can take a sample with the ultra-cheap first trade, or take a major step in bettering your life by picking up the even better Omnivore editions, which average ten issues each, with a ribbon marker, hardcover, and oversized pages. As for this issue, it is wacky, funny, grotesque, creative, engaging, and all around great. In other words, exactly what you can expect from this fantastic series. HIGHLY RECOMMENDED! 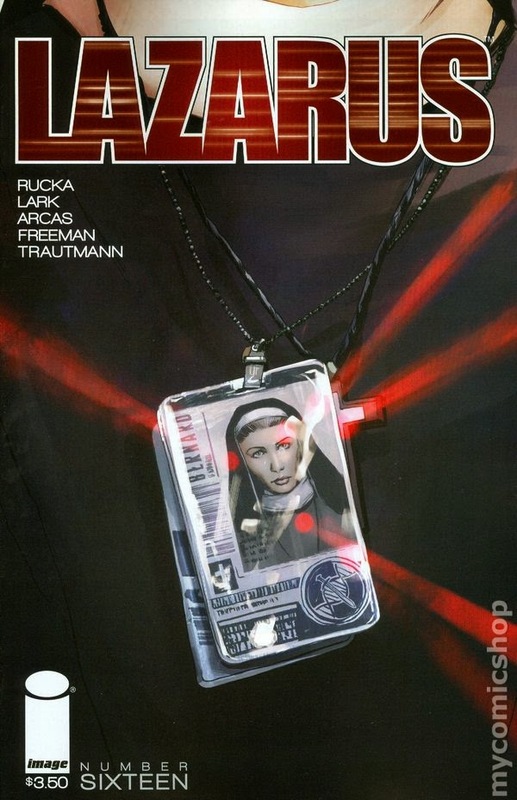 Lazarus #16 - Written by Greg Rucka, illustrated by Michael Lark with Tyler Boss, colored by Santi Arcas, “artifact” pages by Owen Freeman and Eric Trautmann, lettered by Jodi Wynne, design by Eric Trautmann, edited by David Brothers, published by Image Comics. Family Carlyle and Family Hock are about to go to war after the events of the Conclave. Sister Bernard, who is a nun and a physician under the sponsorship of the Carlyles, is unaware of the pending war and about to enter into Hock territory to retrieve something she is not supposed to know about. I find this series troubling. With each issue I read, I’m left upset, anxious, and generally messed up; I wouldn’t have it any other way. Lazarus is a dystopian-future, sci-fi drama that at times seems to be set not all that far in the future, and the science fiction seems to blur into the realm of science possible. 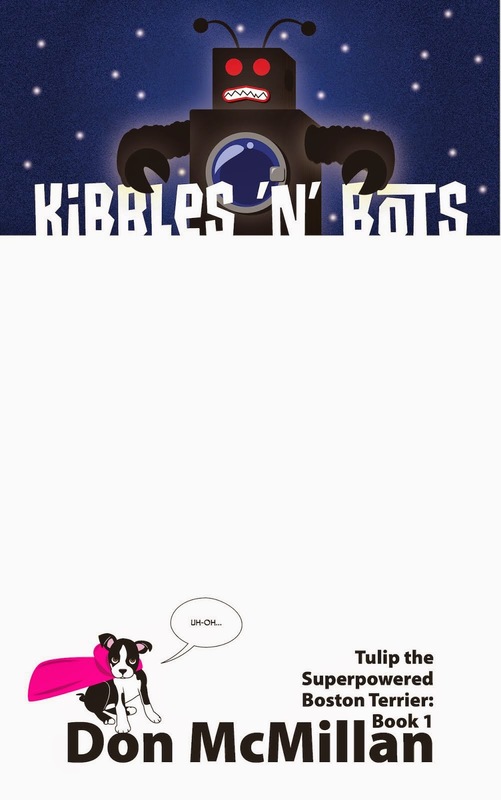 So, why do I continue reading this comic that manages to so thoroughly disturb my Wa? Simple. It’s one of Image Comic’s strongest titles currently being published. 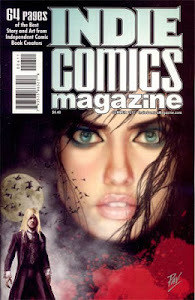 This issue serves as a single-issue break before the next story arc, and focuses on a character we only saw briefly in the second chapter, “Lift,” and serves as a reminder of what happens in this world outside of the main players, where the majority of the population, the Waste as the they are called, struggle to survive. I liked this issue well enough, but the final four pages made things very interesting and brought back my enthusiasm despite the lack of Forever Carlyle, the family Lazarus. Lazarus is an amazing — if not rough on your emotional wellbeing — title, that all fans of dystopian comics and sci-fi should be reading. With three trades available, you can easily catch up before the next big storyline begins. I do have to say that reading this beautifully told story is actually better in single issues, as the back matter further develops the world of the comic, and Rucka offers insight into current scientific discoveries (the real stuff) that bring us closer to the world he and Lark have envisioned. That’s both informative, and utterly terrifying. RECOMMENDED! Daredevil Television Show (Netflix) - Okay, I’m going to keep this brief. 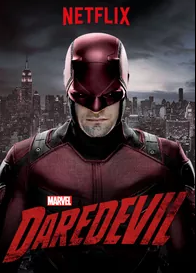 I just finished watching all 13 episodes of this Netflix Original series, and it is safe to say Daredevil is the best superhero television show…ever. Don’t get me wrong, I love both Arrow and The Flash — a lot, actually — but Daredevil left me wanting to ignore the towering pile of “to read” comics in favor of returning to the multitudes of great comic runs for this character. 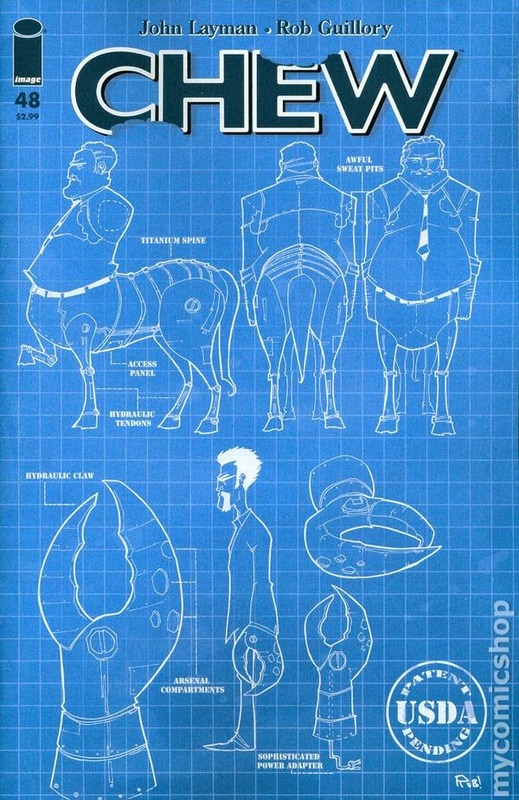 The worst episode was really, really good, while the best completely blew my mind. All of the actors are perfect, they are the characters they portray. The story keeps you engaged and riveted, while the action scenes are mind-blowingly stunning (just see the The Raid-esque, single-take fight from episode two...WOW). The thing about this gritty, violent series is that one of the best episodes, “Nelson v. Murdock,” had little fighting, but rather had two friends talking and arguing through events that had happened in the story, and I could not turn away. That said, the season finale…oh my stars and garters, denizens, it’s awesome. If you are not a Netflix subscriber, then I believe they offer a 30-day free trial, which I strongly encourage you to do, just so you can check out this phenomenal series. But...after you dazzle your senses with this tremendous show, consider staying on as a paying customer. The only way great shows like this will continue to happen is if people continue to subscribe to the service. With Jessica Jones, Luke Cage, and (oh my gosh, oh my gosh) Iron Fist up next, not to mention the loads of other fantastic series already available, I don’t see continuing as a difficult decision. Daredevil is ridonkulously VERY HIGHLY RECOMMENDED! No New Daredevil Episodes For a While – <sob> <sniffle> Looks like I’ll just have to watch it over again. No Song This Week - Sorry, denizens, I’m so buried right now...no time to write a song. But, hey, in the meantime, to solidify my all-consuming love of the Daredevil television show, just replace any mention of an actor in this hilarious Key and Peele clip with an actor from Daredevil, and all mentions of other movies with Daredevil, and that should about sum up what I think of this show.